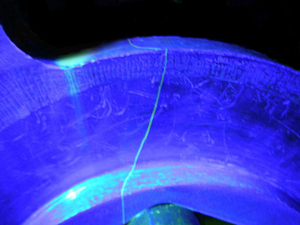 Nondestructive testing techniques allow inspection of parts without damaging or changing their characteristic properties. Testing methods are employed to investigate the material integrity of test objects and to detect discontinuities in test samples that might be detrimental to its safe operation. Parts are routinely inspected to verify workmanship requirements and to detect discontinuities such as cracks, voids, porosity and inclusions. In addition the testing techniques are used to analyze material properties, monitor the operation of internal mechanisms, and determine the integrity of bonds between materials. Constellation Technology is fully capable of performing Non-Destructive Testing (NDT) utilizing Liquid Penetrant, Magnetic Particle, Optical Microscopy, Ultrasonic, and Radiographic (Real-Time X-ray and Film X-ray) techniques. Our experienced scientists and engineers have the Measurement and Analysis expertise to perform Non-Destructive Testing and provide a Solution when required. Several of our NDT team members are American Society for Nondestructive Testing (ASNT) certified, including ASNT Level III for Liquid Penetrant Testing (PT), Magnetic Particle Testing (MT), Ultrasonic Testing (UT), and Radiographic Testing (RT). Our certified staff of NDT professionals provide quality inspection services for a broad range of industries throughout the US and abroad. Our lab technicians are certified to SNT-TC-1A, NAS-410.